"Front Street Cafe is a unique full service neighborhood Cafe open for Breakfast, Lunch and Dinner. 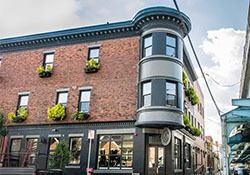 The Cafe offers residents of Fishtown and surrounding neighborhoods a friendly atmosphere and fresh menu featuring farm-to-table, locally sourced and organic New American cuisine with international influences. This unique space houses a coffee shop, fresh juice bar, European beer garden, outdoor terrace with garden seating, indoor & outdoor bars and private upstairs event space."